Using the word summer to refer to Greenland is an insult to the idea of summer. Nevertheless, it was "summer" when a team of researchers from The University of Alabama dragged a radar across the Arctic ice in hopes of seeing underneath. "In the middle, when you're there, it's just all white. You look around 360 degrees, and it's just flat and white," said Christopher Simpson, a doctoral student in aerospace engineering, of the experience of working on an ice sheet where temperatures never rose above freezing in August. "One day we had white out conditions where it was overcast. You couldn't tell the difference between the sky and ground." Despite the extreme conditions, the researchers used a one-of-a-kind radar – developed and built by UA professors and students in less than six months – to help scientists unveil ancient climate history and to provide perspectives on improving climate models. The team included Simpson, along with graduate student Joshua Nunn and Dr. Stephen J. Yan, who specializes in ultra-wideband radar and antenna research. It was the first time a radar, using high frequencies between 600 and 900 MHz, imaged the bottom 10 percent of the ice sheet, which is about 1.7 miles deep, Yan said. These results will contribute to developing satellite missions to completely map Greenland and Antarctic ice. "People have used radars for a long time, but we are innovating to do something that has never been done with this technology," said Dr. Prasad Gogineni, lead UA engineering researcher on the project and an internationally recognized expert in the field of remote sensing. "We took measurements that could not be done otherwise." It is uncertain how much glaciers and ice sheets will influence rising seas because scientists are not quite sure how they behave, contributing to wide predictions of future sea levels. To provide clarification, an international team of researchers is studying the North East Greenland Ice Stream, led by Professor Dorthe Dahl-Jensen at the University of Copenhagen. 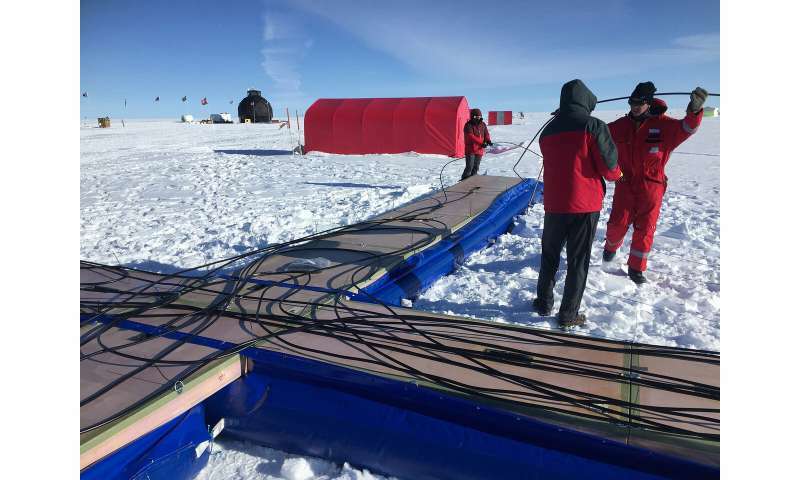 Engineering researchers at UA developed a radar to provide an accurate image of what occurs at the base of the ice. The radar is the first of its kind, advancing the use of a type of radar known as ultra-wideband surface-based radar for scanning the interior of ice. Like a slow moving river, the North East Greenland Ice Stream carries water into the ocean by dumping icebergs and from melting on its edges. Its speed is increasing, but changes in the ice stream are not well understood, making it difficult to predict through modeling. "If you believe in climate change or not, coastal protections are a major issue in the future," Gogineni said. "This work contributes to a better projection of what the sea level will be and how we can protect the coasts." 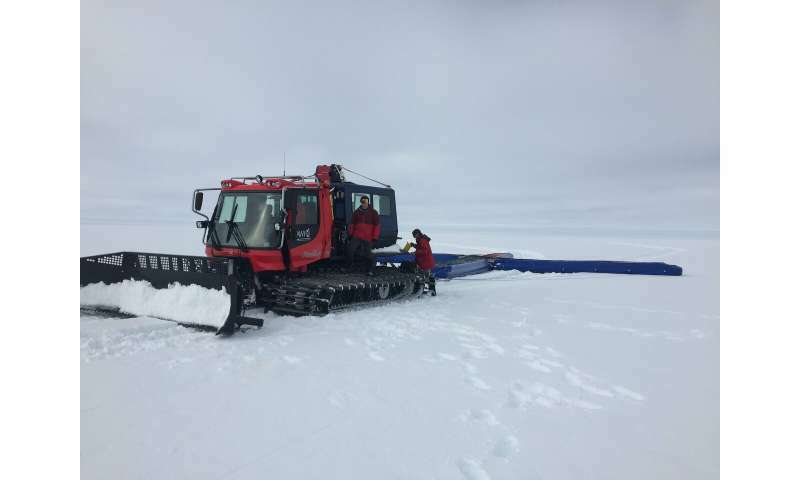 The ice stream has been studied heavily through drilling ice core samples and radar surveys, and Gogineni has been involved in several such projects at his previous position at the University of Kansas. However, this project aims to understand how the structure of the ice crystals and the interaction within the ice, particularly at the bottom, has influenced flow over time. To help with that, researchers need a detailed image of the ice stream from the radar built by the UA engineers. The radar is being used to expand knowledge from a site where an ice core sample will be removed. The ultra-wideband radar operates in the Very High Frequency and Ultra High Frequency bands to penetrate deep into ice, as opposed to commercial radios or satellites that use microwave frequencies with large antennas to transmit over longer distances. The radar is 1,000 times more sensitive than the current state-of-the-art radar used to image glaciers, operating at a higher power with a bigger, yet lighter, antenna than similar radars for ice sounding, said Yan. "The larger the antenna, the more sensitive the system," he said. While Yan and his students designed and developed the radar, Dr. Charles O'Neill, aerospace engineering researcher at UA, and his students built the radar antenna. Shaped like a plus sign 17.5 yards wide by 19.6 yards long and made up of 16 connected antenna panels, it was pulled over the ice surface at about 4 mph, moving much slower than existing airborne radars and thus allowing more sensitive measurements. The team in Greenland covered about 60 miles during two weeks on the ice. The system sent signals deep into the ice, giving a vertical scan of the internal structure of the ice at a resolution of less than two feet. This helped scientists better understand how it formed over time. Collecting nearly 20 terabytes of data in the field, the UA team will generate fine images of the bottom of the ice stream. The plan is to return to Greenland later this year for radar testing before going to Antarctica to support core drilling.